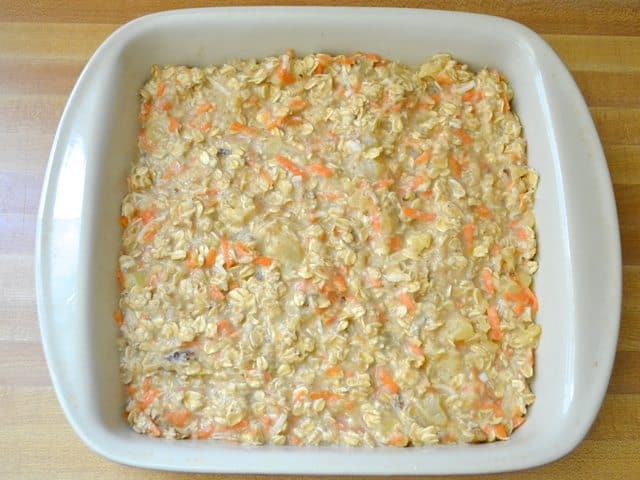 After a long egg breakfast phase (fueled by this simple technique for soft boiled eggs), I’ve begun craving my old standby, baked oatmeal. I had the intention of making a carrot cake-esque baked oatmeal, but the more ingredients I thought about adding, the more it began to resemble those super scrumptious Morning Glory Muffins. 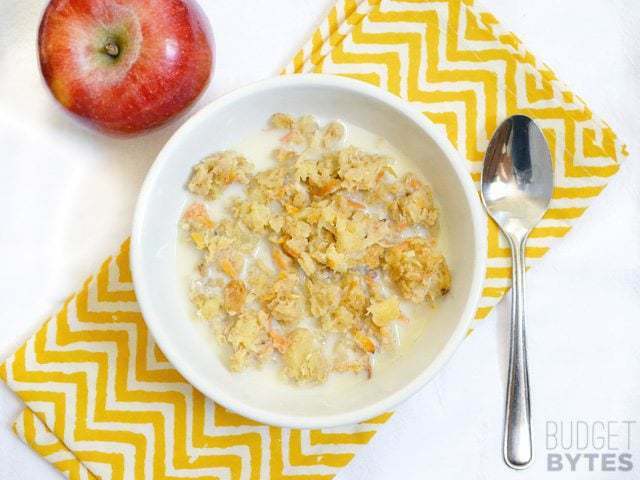 The baked oatmeal version has all the awesome flavors and textures as the Morning Glory Muffins (apple, pineapple, coconut, walnut, and carrots), but is quite a bit easier to make, has less sugar, and feels more like breakfast than a treat or dessert. I love it! If you’re new to baked oatmeal, they’re a great make-ahead breakfast that can be quickly reheated each morning for a filling and healthy start to your day. Although it does take a little time to bake, the preparation is simple – you just stir everything together, then pour it into a casserole dish, and then bake. 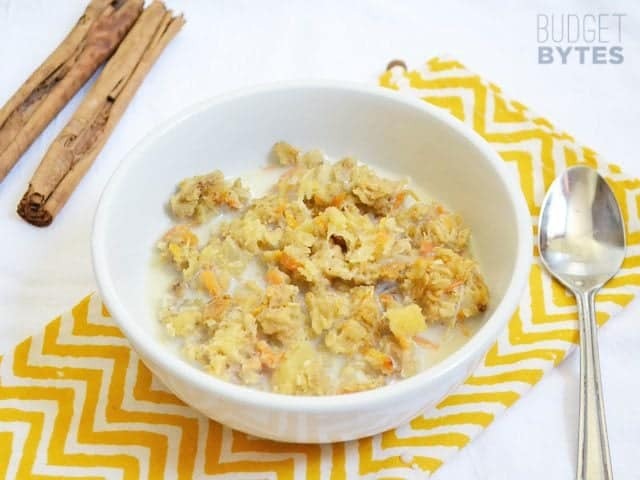 The oats absorb the lightly sweetened custard-like base as they bake to create a soft, warm, non-gooey version of oatmeal. 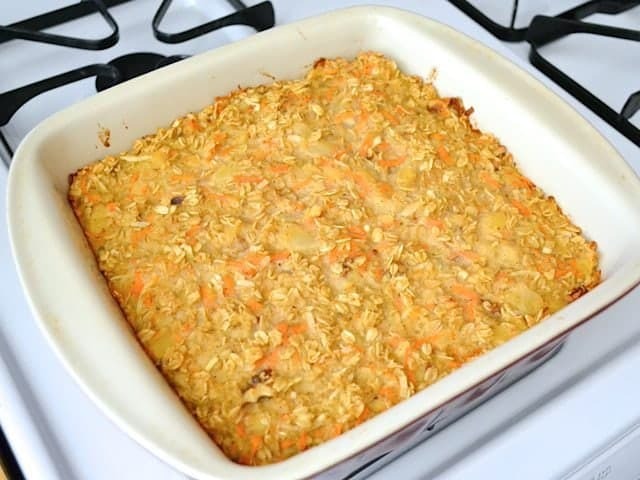 Many people misinterpret the photos and think that the baked oatmeal is crunchy, but it is not. It is soft, moist, and almost fluffy in texture. It’s just fabulous. So, here’s the newest version! Preheat the oven to 375 degrees. 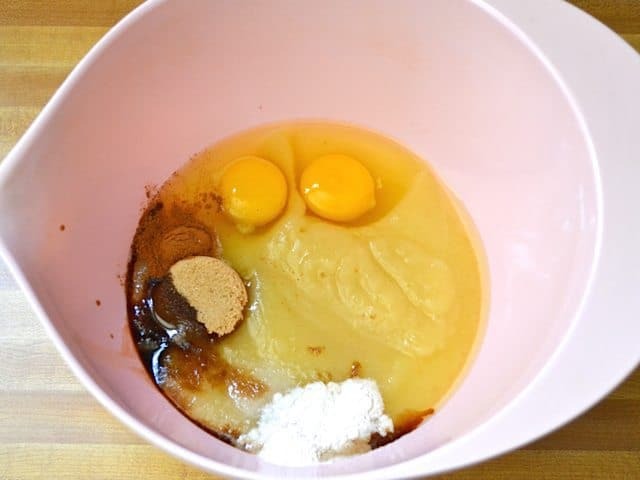 In a large bowl whisk together 1 1/2 cups unsweetened apple sauce, two large eggs, 2 Tbsp brown sugar, 1/2 tsp cinnamon, 1/2 tsp vanilla extract, 1/2 tsp salt, and 3/4 tsp baking powder. A whisk works best for this step to help break up the eggs and get everything well incorporated. Peel 2 or 3 carrots and then shred them with a cheese grater. You want about 1 1/2 cups of shredded carrots total. 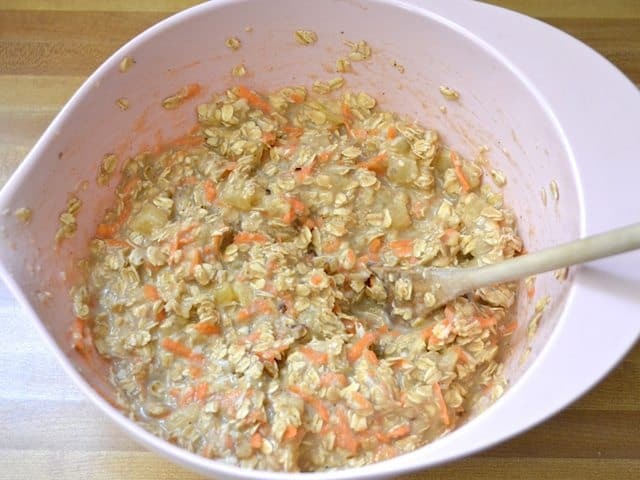 Drain one 15-ounce can of crushed pineapple in juice (you don’t want to add TOO much moisture to the oats). 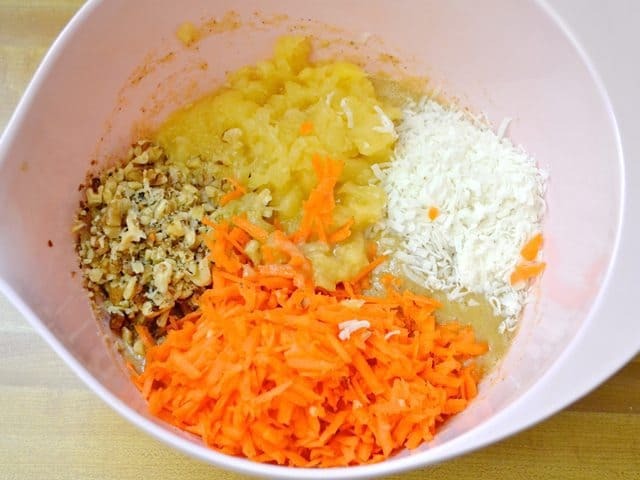 Add the carrots, pineapple, 1/3 cup chopped walnuts, and 1/3 cup shredded (sweetened) coconut to the bowl. Stir to combine. You’ll want to switch to a spoon for this step because all the little bits will get stuck in a whisk. Add one cup of milk (dairy and soy both work well) and stir it into the mixture. Lastly, stir in 2 1/2 cups of dry old-fashioned rolled oats. Although some people have used “quick” oats for my baked oatmeal recipes, I think the old-fashioned rolled oats work best because they have more texture. Steel cut oats require more cooking time and more moisture than rolled oats, so you can’t simply sub those in place of the rolled oats. 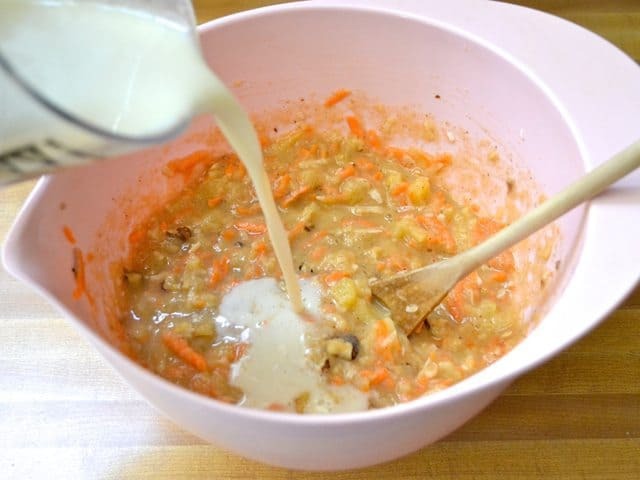 Pour the mixture into a casserole dish coated with non-stick spray. You’ll want to use a basic 8×8 or 9×9 inch casserole dish. Bake in the preheated 375 degree oven for 45 minutes. Now it’s ready to eat! Or ready to refrigerate for the rest of the week. I like to add a little splash of milk on top and then I’m ready to dive in! It’s sweet, full of texture, and loads of flavor! Question for Beth or anyone: what about making this in a muffin tin for grab-and-go capability? You can definitely do that! It might bake faster though, since there is more surface area contact with the heat. This sounds amazing. Do you think I could sub boxed coconut milk? I don’t often keep dairy milk on hand and I have sensitivity to almonds. Can’t wait to try this! If you’re talking about the type of coconut milk that is sold as a dairy milk substitute, then yes. The canned type might not have a high enough moisture content to work quite the same. 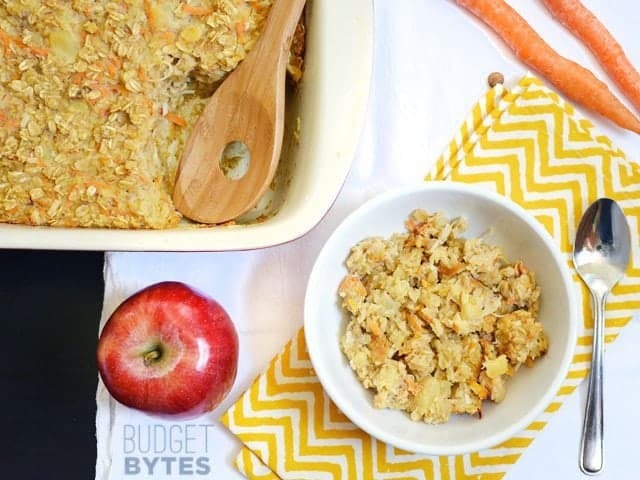 These baked oatmeal recipes save my mornings!! I love having a huge batch of healthy, filling, hot breakfast that takes just a minute to get ready. This is one of my favorites, and I have tried several of your recipes. I replaced the applesauce with mashed bananas because I had 3 black ones on the counter and I needed to use them up. I also added raisins. This was great! Mashed bananas are an awesome idea! How many did you use? I love this recipe. I had just been eating oatmeal everyday and this totally brings it up more than a notch. I even used fresh nectarines (since they are in season now) instead of the pineapple yesterday… amazing. You can also add in flax seed meal with no ill effect. It’s such a versatile recipe. Thank you, thank you! Absolutely love this! Made it yesterday for hubby and I to eat all week before work. This is my 4th baked oatmeal recipe of yours and probably my fave!! Love your website! Can’t wait to try the smoked tomato soup recipe you just posted! In my Top 10! Make and freeze in portion sized scoops. Add frozen berries or Greek yogurt to eat. So fast and YUMMY!